Men’s basketball has embarked on a dominant run since winter break began, going 8-1 since a Dec. 18 win over Penn St. Harrisburg. The team has only lost twice since November, both times against Little Three rival Williams College. Included in this winning streak are four wins over ranked opponents, as well as four interconference wins. These highlight games are punctuated with comfortable victories over unranked teams, showing that the Cardinals are capable of defeating strong teams as well as taking care of business against teams they should beat. Austin Hutcherson ’21 has lead the way for the Red and Black. The sophomore guard tops the team in scoring with 19 points per game, and is fresh off being named NESCAC player of the week following two 30-plus point games against Middlebury and Hamilton. He’s good under pressure as well; Hutcherson drove the length of the court before hitting a game-winner against Amherst with only three seconds remaining on the clock. Senior captain Jordan Bonner has also been terrific for the Cardinals, averaging 17 points and 11 rebounds over the past six games, while having topped 20 points in each of the past three. While many students may have fled to warm climates this break to escape the Connecticut cold, Wesleyan traveled to Barry University in Miami Shores, Florida for a different reason: to participate in the HoopMIA D3 Holiday Shootout tournament. On the first day of the tournament, the Cardinals cruised past Penn State Harrisburg, dominating 81-68. Hutcherson and Antone Walker ’21 scored 20-plus points apiece as they helped to snap the (not-Nittany) Lions’ six-game win streak. The following day, Wesleyan defeated No. 13 SUNY Plattsburgh by way of a dominant second half that included a 28-5 run. Walker was highly efficient in the first half, scoring 14 points on 4-7 shooting. Upon returning to campus, the Red and Black soundly defeated Manhattanville College 99-62 before traveling to Williamstown to take on their toughest challenge yet. As Wesleyan had previously faced No.2 Williams in a non-conference game, the contest on Jan. 4 served as the team’s NESCAC opener. Unfortunately, despite a strong second-half rally, the Ephs emerged victorious by a 68-54 margin and swept the regular-season series against Wesleyan. Hutcherson, the only Wesleyan player to reach double digits, scored 17 in the loss. Regardless of the final score, however, the Red and Black remain undaunted, and hungry for another crack against their perennial rivals. Wesleyan had less than a day to recover from the tough loss before traveling all the way to Vermont to take on another difficult opponent, No. 24 Middlebury. Rather than fold on the second day of a road back-to-back, however, the Cardinals narrowly escaped with an 80-77 victory over the Panthers. Hutcherson dropped a career-high 36 points, while Bonner and Jordan James ’21 both scored in double-digits. Following the victory, the Red Birds got a much-needed six-day rest before earning their best win of the season, burying No.6 Hamilton 73-69 in their NESCAC home opener. 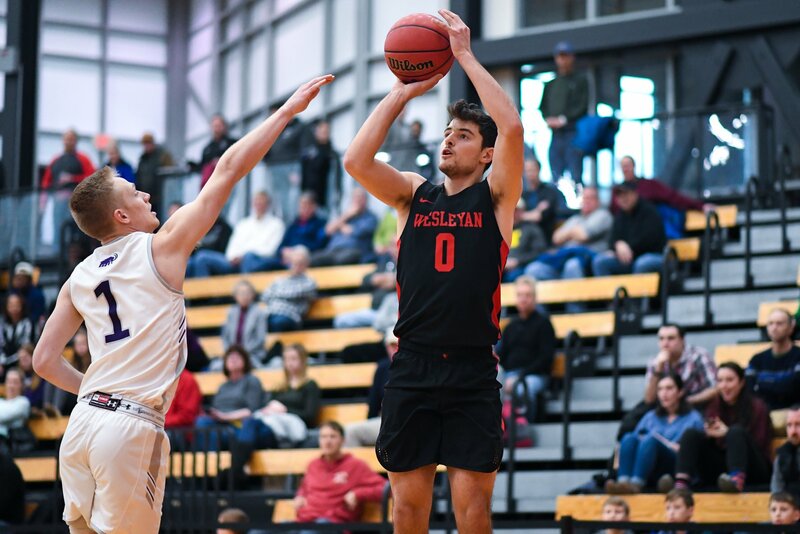 The Red and Black overcame a 13-point deficit in the second half behind 12 straight points from Hutcherson, who scored 24 total in the final 20 minutes of regulation. He finished with 32 points total, helping to deliver the Continentals’ first loss of the year. The Cardinals took advantage of nearly every opportunity they got at the free-throw line, making 22 of 23 foul shots. The next day, Wesleyan entertained its third Little Three match of the year in the form of No. 24 Amherst. Wesleyan’s defense stifled the Mammoths in the first half, holding them to only 19 percent from the field. In the second half, however, Amherst was able to rally from a 31-18 deficit to knot the game at 60 apiece with 11 seconds remaining. It was here that Hutcherson’s aforementioned heroics occurred, letting the Cardinals escape with a 62-60 win. Wesleyan crushed Pine Manor College 83-57, then moved on to their penultimate game of the break against unranked Conn. College. Wesleyan opened up an 8-5 lead in the first half and never again trailed. Although the Camels brought the score within five late in the game, the Cardinals hit five free throws in the final 40 seconds in order to top the Camels 78-70. Bonner lead the team with 24 points and ten rebounds. In the midst of such a spectacular run, the Cardinals are confident that they can make a deep run in the postseason. Now 4-1 in conference play and 13-4 on the season, the Red and Black play their final game before classes resume against SUNY Purchase on Jan. 21. Their next conference game is on Friday, Jan. 25 away against Bates. Drew Kushnir can be reached dkushnir@wesleyan.edu.